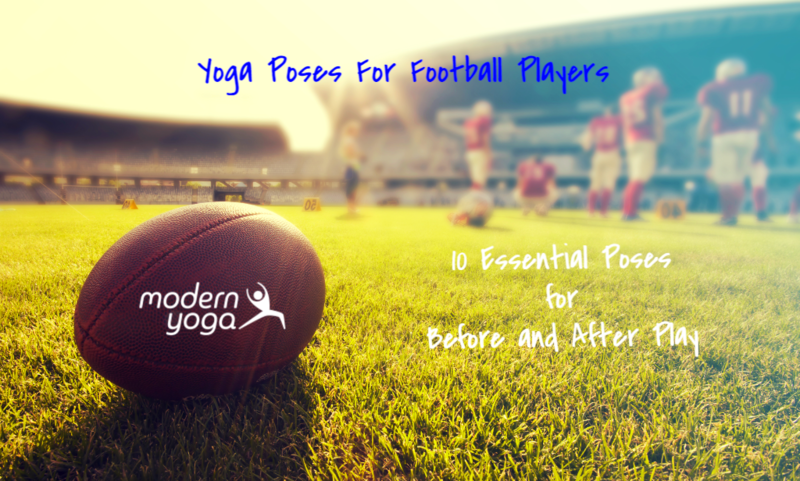 Yoga For Football Players; 10 Essential Yoga Poses for Before and After Play. Adding Yoga to a football teams training will result in improved Strength, Balance, and Flexibility that promotes Control, Focus, and Recovery. Consistent yoga practice will improve strength, balance, and flexibility by teaching the concepts of body control, focus of the mind, and holistic recovery which will result in improved overall performance. Strength – Control – Strength is improved through body control. In addition to physical control of the body, the discipline of breath awareness is also taught. In addition to strength in body and breath control, control of the mind is taught just as it is needed on the football field; learn to prepare, adapt, and stay focused. Balance – Focus – The balance poses in yoga promotes focus that will translate to the field. The focus needed to balance allows the student to focus on the physical and mental goals needed to be successful. Controlled breath practices are taught to maintain focus. Flexibility – Recovery – Consistent yoga practice promotes and creates flexibility in the body. Improved flexibility and post-game stretching also improves recovery time and reduces muscle soreness. Gained flexibility improves range of motion, strength, and performance. Start on all fours (tabletop position) and switch between arching your back and rounding it out. This smooth motion massages the spine and extends the low back. With your feet and hands on the floor, raise your hips so your body is in an upside down V position. Let your head and neck relax, and spread your shoulder blades. Reaching and extending your body will help open your lower and upper back. Come to all fours , sit back. Extend your arms forward and your hips back so that they are resting on your heels Bring your forehead to the floor. You will feel a long, rejuvenating stretch down your back and through your hips. You can add a block or pillow underneath for additional support. This pose is great for prevention by combining strength and stretch. Stand with your feet about three feet apart. Align your right heel with the arch of your left foot. Square your hips forward and place your left hand near your right toes. A block is often helpful here. Rotate to the left rib into a side twist to the right. Reach your right arm towards the sky. If this hurts, or is too hard to stretch, raise the height of your block. Look either down at your left fingers for a neck release or up at your right thumb for more stretch. Repeat on the other side. In a seated position with your legs extended forward, reach for your shins, ankles, or feet, bending at the hips. It is important to reach your sternum forward so you can extend the torso. Place a bolster or block a couple of inches away from a wall, further if you have tight hamstrings. Lay one hip close to the wall and swing the legs up as you come onto your back. Shimmy in towards the wall until your lower back is comfortably resting on the prop. You should feel secure on your lift with the whole of your pelvis supported but not digging into the waist. Lie either with the arms out 45 degrees to the side, palms up or arms over the head if your shoulders feel open enough. Lying on the floor, comfortably position your feet close to the buttocks, hands palm-down by hips. Make sure the feet are hip width apart, and the outsides of the feet are parallel. Feeling good contact in your heels, inhale and lift the pelvis off the floor one vertebra at a time. Keep rolling the thighs in, flatten the belly and lift the breastbone towards the chin. Locust is a great way to add strength to your back and buttocks. As you lie on your stomach with your forehead on the floor, slowly lift you head, legs, and arms up and away from the floor. Hold the pose as long as you can and then release. As you are laying face down, just like locust pose, reach your hands back and grab hold of the outsides of your ankles. Lift your chest and thighs away from the floor by drawing your chest forward and the back of your thighs toward the sky. This posture is great for your back, but if you have an injury can be a very intense pose. Lying on the floor, extend left leg out, bend your right knee and pull it up towards your right armpit. Keep your left leg straight and take your right knee across your body to the left. Extend the right arm to the right and take your gaze towards your right hand. You may roll all the way over onto the left hip until your knee touches the floor. Repeat on the other side.